Flying Monkey at Kampong Glam is opened by engineer-turned-restaurateur Sumeet Singla whose family owns a Michelin-starred restaurant in USA. His own restaurant, Pizza Fabbrica, next door to Flying Monkey, is greeted with widespread acclaim and has won the prestigious Gambero Rosso award for Best Pizza in Singapore. Pizzas are basically Italian naans, right? JKJK. So it comes as no surprise that his Indian tapas bar is as excellently conceptualized as it is executed. He enlists the help of Kannan (formerly from Prime Society, Cufflink Club, and Long Chim) who helms the bar and has created some original, delicious cocktails. The Flying Monkey ($18) is a reinterpretation of Old Fashioned, using Monkey Shoulder Whiskey, ginger, Jaggery syrup and bitters, which is smoked with applewood–strong and masculine, my kind of drink. Mind it! ($18) pays homage to the Indian heritage: a Monkey47 gin-based drink with maple syrup, fresh mint, and jasmine, the essential flower for Indian families. Yoyo Mani ($18) is a tropical drink with rum, coconut, and 5-spice Kerala rice syrup–easy and fun like a day out at the beach. 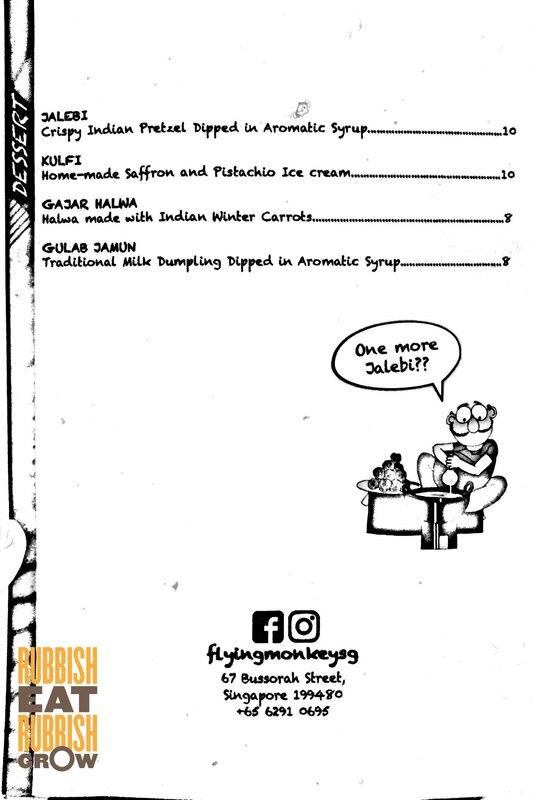 While Flying Monkey isn’t the first to have Indian tapas concept–Maziga Cafe is–the food is rather good with the help of Chef Azad, a Yantra alumni, and a 500-degree tandoor oven. Which means you have to try the tandoori chicken ($10), marinated overnight with the chef’s special blend of masala. Lovely burnt ends, very tender. 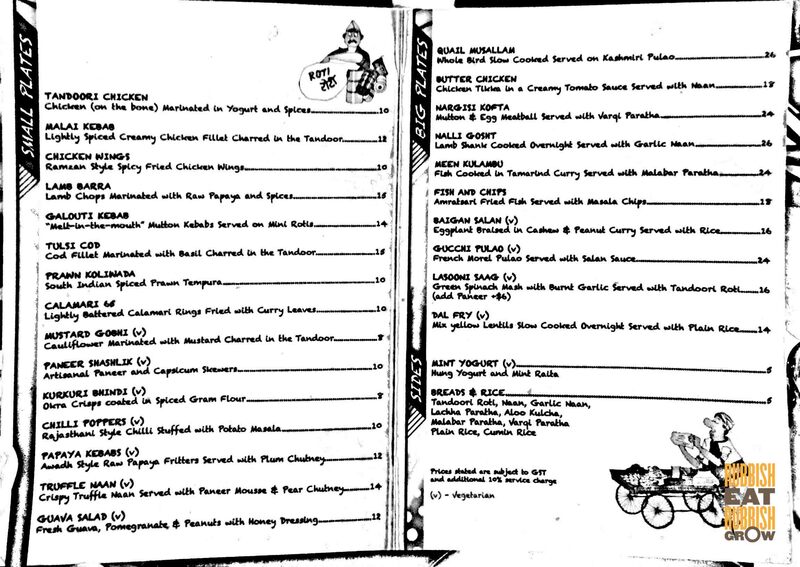 Chicken 65 is classic South Indian dish with apocryphal theories behind its name: “It’s cut into 65 pieces,” “It’s invented by a guy who is born in 1965,” “It has 65 chillis,” “It is marinated for 65 days…” Whatever the case, this calamari 65 ($10) is a refreshing and surprising reinterpretation of both calamari and chicken 65. It’s addictive, and not very spicy, and goes well with alcohol. However, it could be crispier. “Does it come with 65 pieces of calamari?” asked Mr Fitness. Unfortunately, it doesn’t. The truffle naan ($14), or Indian pizza, comes with paneer mousse and pear chutney, an interesting combination. Not bad. No complaints. My favorite dish, tulsi cod ($16), is marinated with Italian basil to give it that sweetness and charred in the tandoor. At first, you taste the “greenness” of basil, which gives way to the sweetness of the caramelized skin, before finally tasting the delicate fish. The reason why this is my favorite, besides its complexity, is that the flavors do not overpower the cod; you can still taste the cod. But not all dishes are good. Everyone around the table disliked the galouti kebab ($14) which is marinated with unripe papaya. The gaminess of the lamb overwhelms the entire palate, tasting like blue cheese. I like blue cheese, but this is choking. The other dish that I didn’t take to, quail mussalm ($26), slow-cooked quail on kashmiri pulao (buttered, saffron-ed bismati rice with raisins), because the curry here is too sweet, which comes across as strange for me. Mr Fitness’s favorite, nalli gosht ($26), is a very tender lamb shank cooked overnight and doused in a rather spicy peanut-cashew curry that everyone loves. It comes with very good garlic naan, toasted crispy with lovely burnt ends. Although the Flying Monkey is a bar that allows you to let down your hair and go bananas, it means serious business, not monkey business, when it comes to the excellent food, decor, and cocktails. Not sure if the bar is named after the flying monkeys in Wizard of Oz, but on the planet of restaurants aping each other, The Flying Monkey stands strong like King Kong. I watch too many movies. –Best Prata in Singapore: After Eating 72 Pratas!